The mission of this program is to grant scholarships to a group of young people between the ages of 15 and 18. In an 18-month program of classes given by a staff of prestigious contemporary artists from Argentina, the selected individuals selected are provided with a basic education in the visual arts free of charge. The program includes workshops, materials, theory classes, visits to museums and/or cultural centers, meetings with professionals working in the art scene and the chance to further their education as graduates once their term at the program has come to an end. The Program aims to guarantee the highest level of instruction and to provide students with the education they need to enter the world of contemporary art at both the national and international level. There is an open call for applicants, who are evaluated on the basis of their artistic potential. The selection is aimed at putting together a heterogeneous group of students from different socioeconomic sectors of the city of Buenos Aires, Greater Buenos Aires and other regions of the country. One of the fundamental aspects of the program is the horizontal, pluralistic nature of the group of students, who for a year and a half are offered the same sources of stimulation and opportunities to develop their potential. 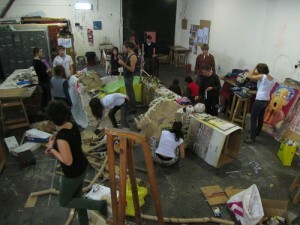 The basic education at the School is structured around three physical spaces: the Studio, where students work under the supervision of a group of artist-teachers; the Media Library, where students conduct research and take the theory classes, and the Gallery, where they explore different exhibition formats under the supervision of teachers or attend presentations by guest speakers. The three work spaces (the Studio, the Media Library and the Gallery) are available to students outside of class time as well. Twice a year—in August and December—there is an Open School day in which students share with the community the projects they have completed, as well as works-in-progress and site-specific interventions. The call for applicants takes place every two years in a public campaign that includes communication in the mass media, at high schools in the city of Buenos Aires, cultural centers and relevant public offices in the province of Buenos Aires. In their applications, potential students send via email between five and ten original works and a form with their personal information. The jury—comprised of members of the board and teachers from the School—makes an initial selection of thirty young people who are invited to a invited to a general briefing and then to a personal interview with their parents or legal guardians. The topics covered in the interview include the young person’s relationship to art, his/her socioeconomic situation and whether he/she can make the commitment necessary to complete the program. After the interviews, the jury chooses the 20 young people who will receive the scholarship.